The device was made safe with a controlled explosion. 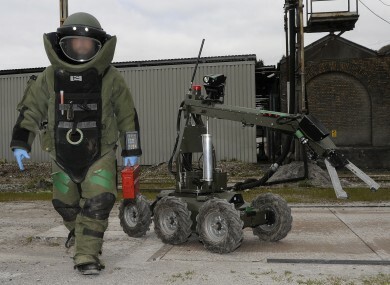 THE DEFENCE FORCES bomb disposal team has made safe a live historic grenade discovered by a man at a private residence in Janesboro, Limerick. The homeowner found the device while out gardening yesterday. The army team confirmed that it was a Mills Type grenade dating back to the 1920s War of Independence era. The callout from gardaí was made before midnight yesterday and traffic restrictions were put in place for public safety. A number of nearby houses were also evacuated. The grenade was taken to a safe location nearby where it was made safe by means of a controlled explosion. The site was declared safe within 40 minutes. Email “Man finds live War of Independence grenade while gardening in Limerick”. Feedback on “Man finds live War of Independence grenade while gardening in Limerick”.